A large and extremely variable species, the Variegated Squirrel is one of Central America’s well-known critters. This squirrel is well named, and comes in many color forms throughout its range. It is a typical tree squirrel—slender with a long, rather bushy tail edged in white or cream. It has conspicuous ear spots and coarsely grizzled hair on its back. There are at least eight distinct color patterns throughout its range and several intermediate forms, and 14 recognized subspecies. The dorsal color ranges from blackish to reddish-brown and yellowish-gray to white; the underside color ranges from white to cinnamon-buff. In Panama, the Variegated Squirrel is either entirely dark-brown or black (in western Panama) or has a dark-brown back with buffy accents and creamy white underside with white ear spots (in central Panama). There is little seasonal change in their coat. There is no size difference between males and females, but rather variable size between individuals in the same general area. 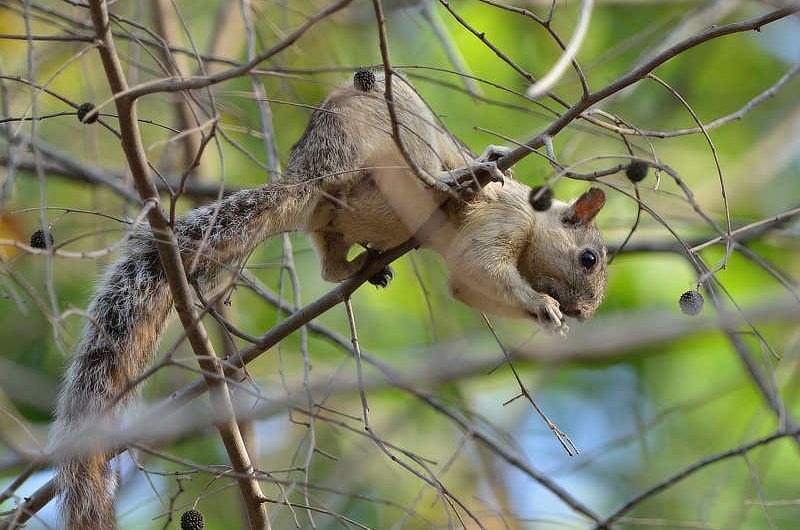 Variegated Squirrels inhabit dry deciduous and evergreen forests and secondary growth and are common in plantations and open areas. They are more frequently encountered in open woodland rather than inside mature forest (where the Red-tailed Squirrel is more likely to be found). They are diurnal and arboreal, and generally solitary. Variegated Squirrels feed on soft fruits such as mangos, flowers, seeds and nuts. Unlike many other species of squirrels, the Sciurus variegatoides does not hoard its food, and therefore does not play a large role in seed dispersal. They are not overly vocal, but give low ‘chunk’ calls and harsh chatters on occasion. Variegated Squirrels are predated on by weasels, foxes, wild cats, hawks, owls and snakes. In Panama, the Sciurus variegatoides breeds between April and May. Babies are born in a nest of sticks and leaves made by the female. Being solitary creatures, males and females only come together to mate once a year, for only one day. After mating, males and females separate and there is no pair bond formed. All the parental care is done by the female. The female gives birth to a litter of two to eight pups after a gestation period of 33-46 days. Newborns are blind and naked, and start developing fur at approximately 2 weeks and open their eyes around 4 weeks of age. They leave the nest at 6 weeks old. Young are weaned and begin to socialize at 10 weeks, and are solitary and sexually mature by 15 weeks of age. Variegated Squirrels live 8-12 years in the wild, and up to 23 years in captivity. Variegated Squirrels are widespread and common throughout Central America, from southern Mexico to central Panama. They are found in the lowlands and foothills to 1800 m. Variegated Squirrels can be commonly seen around all the Canopy Family lodges. In medicine: The Variegated Squirrel is a known carrier of “Variegated Squirrel 1 Bornavirus,” which fatally affected squirrel breeders in eastern Germany in 2015.